Very limited supply! Free USPS Ground Shipping! A complete BOM in a convenient shipped-one-time-only complete kit form! 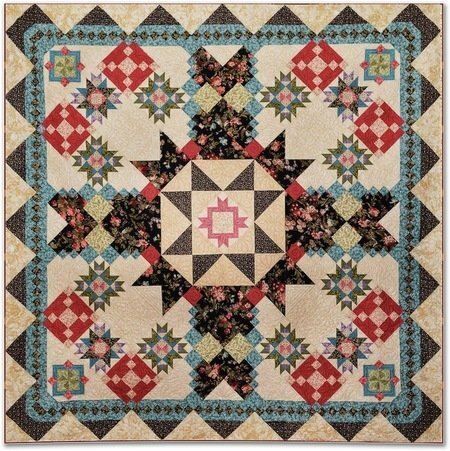 Featuring an over-sized medallion styling and fabrics that range from rich black to soft neutrals, this striking quilt is perfect for anyone who doesn't like to wait to receive monthly installments, and the clear, easy-to-follow directions are perfect for newer quilters who desire a traditionally pieced project as well as experienced quilters who appreciate well-written instructions. This kit includes all patterns (a $ 72 value! ), and includes all of the fabrics required for the top and binding only. Lovely reproduction-style fabrics from Windham were designed specifically for this BOM by Denice Lipscomb. Backing: 8 yards of 42"-44" fabric, sold separately. 100% Cotton--Always the finest quality!